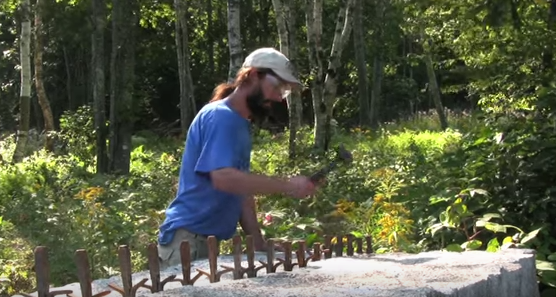 Dennis Carter, who runs Deer Isle Hostel with his wife, Anneli Carter-Sundqvist, uses a two-pound hammer to cut a 26,000-pound block of granite. The craft of stone cutting stretches back to the time humans began using tools, and it continues today. The Maine Contractor Directory lists 56 stone masons, from Stockholm to Old Orchard Beach. Even more practice the art on their own, including Dennis Carter, who runs Deer Isle Hostel with his wife, Anneli Carter-Sundqvist. The video above shows Carter using a two-pound hammer to cut a 26,000-pound block of granite. In the video, he explains it’s important to pound the spikes into the stone slowly, as many little cracks can form and gather together quickly. It’s important to be patient. In the video, which was submitted to Reddit yesterday, you can hear the stone cracking. “We’re building buildings in here like it’s the 19th century. Around here they built the foundations with granite. And where you find one it still usually looks just like when they put it there — pretty,” he says. Read a profile of the off-the-grid hostel here.